I know right? I don’t really do trainers & sweats so this is my version. woooo im loving the whole look! chic! Yes it is comfy. I can’t be arsed suffering for style any more haha! I’m the same! They are so handy, I’ve even found a few small glam ones. Most importantly for me: I can’t loose it lol Oh & bag snatcher hate them obv. Love the pants! They look so lightweight. Love your top! It’s perfect for the summer! Thanks, the photo came out slightly over-exposed but I’m glad people seem to like the detail. 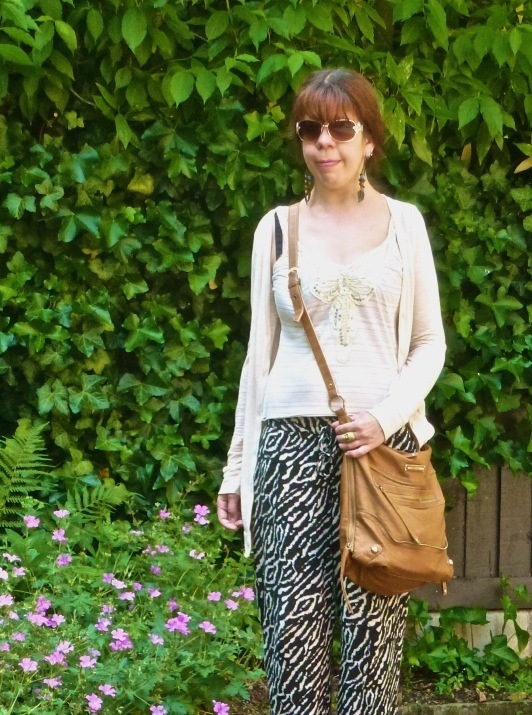 Love the bold pattern of your pants! So fun! Thanks! It sounds silly but wearing them always gives me more confidence, roarrr! Love those pants! It is such a lovely outfit! Great pants! So fun and perfect for this season!